Although the local market for pangolin still revolves principally around traditional healing, followed by a much smaller trade in bush meat, South African pangolins are increasingly under threat of extinction. They are being caught and trafficked by middlemen, driven by opportunism or desperation, who regard this elusive animal as a lucrative commodity. In many cases, the middlemen conduct some form of cross-border trade with neighbouring Zimbabwe or Mozambique, and this could form part of the larger transnational trade in pangolins that is threatening the survival of this ancient species. These are the findings of an investigation conducted by Oxpeckers in collaboration with Special Assignment in August this year. According to the Limpopo-based anti-poaching unit, Protrack, since the beginning of 2016 there were seven arrests in the province where, along with the Northern Cape, the Cape Ground Temminck pangolin – a species indigenous to Southern and South Africa – is most commonly found. Some of the arrests involved foreign nationals allegedly colluding with South Africans who were allegedly aware of the pangolin’s value as a lucrative commodity in the transnational trade. Furthermore, according to the Environmental Management Inspectors, commonly called the Green Scorpions, there have been arrests in Gauteng. “We recently arrested four Zimbabwean nationals in Kempton Park, trying to sell a pangolin, who have since been charged with illegal possession and selling,” said Eric Mbhele of the unit’s Gauteng division. Mbhele would not elaborate on the details of the case because it was still sub judice, but he said the transnational trade is becoming a concern. Mbhele said the the Green Scorpions are determined to crack down on the muthi markets implicated in pangolin trafficking. “For too long we have turned a blind eye to the illegal trade in the muthi markets, but we are planning to shut down the supply chain that often begins at these markets,” he said. Ancient cultural beliefs, involving the small-scale harvesting of pangolin scales, blood and fat for medicinal purposes, may not be a major threat to the survival of the species. Bruyns said there hasn’t been a sustainability problem with pangolins used in traditional medicine and it would be a tragedy for ancient cultural practices to be wiped out purely in order to save an animal. At one of the muthi markets we visited in August as part of the investigation, an undercover investigator was initially offered pangolin scales and body parts to cure his ailments. The young trader, who was clearly not a practising sangoma, then offered to travel to Mozambique to fetch a live pangolin, at a hefty price. He claimed to have “dealers” near Maputo who would provide him with the illicit cargo, and insisted on a substantial deposit upfront as surety. “These days, a cross-border middleman carries more weight than a respected sangoma. It’s all about the money,” said the African Pangolin Working Group’s Darren Pietersen, who is also Africa vice-chair of the IUCN Species Survival Commission Pangolin Specialist Group. Although South Africa’s pangolin trade is restricted, in urban and rural muthi markets most of the trade is conducted without the required permits. “Sometimes the traders genuinely aren’t aware that they are breaking the law,” said Rynette Coetzee, the biodiversity officer at the Gauteng Department of Agriculture and Rural Development. Traditional healers interviewed blamed the debilitating drought in these rural regions on the pangolin’s “blood being spilled incorrectly”. Conservationists underscored the need to work alongside traditional healers in educating rural youth, who feel increasingly alienated from cultural tradition, on the ecological value of the pangolin. In Acornhoek, near Bushbuckridge, an environmental NGO called Nourish has embarked on an initiative to teach schoolchildren about the imperatives of preserving all of South Africa’s biodiversity, for future generations. “Whether it is through teaching them to plant a tree or about wildlife conservation, we are letting our children know that our survival depends on nature’s survival,” said Nourish facilitator Prince Nkuna. Although a million pangolin are thought to have been killed in the past decade, no one knows for certain how many are left. The African Pangolin Working Group is a non-profit organisation established in 2011 to research, raise awareness and lobby for greater protection of the species. But research is very much in its infancy, due to the elusiveness of the pangolin and funding shortages. “We must remove demand and increase stiff penalties for wildlife crimes,” said Ray Jansen, who chairs the group. It is a trade driven on the supply side by poverty and opportunism; on the demand side, by greed. Each year an estimated 100,000 pangolins are snatched from Africa’s bush and smuggled to Asia, where demand by increasingly affluent consumers has spiked unabated. There, pangolin meat is considered a delicacy and their scales allegedly “cure” every condition from acne to impotence. They are trafficked dead or alive, fresh or frozen, skinned or camouflaged by “legitimate” cargo. In June, Hong Kong officials made one of the largest ever seizures of African pangolin scales after discovering 4.4 tons (4,000 kilogrammes) of scales hidden in cargo labelled “sliced plastics” from Cameroon. The haul is estimated to represent between 1,100 and 6,600 pangolins and to be worth $1.25 million, according to the IUCN. In August Indonesian authorities seized more than 650 pangolins found hidden in freezers. But these busts represent less than a miniscule percentage of the scale of the burgeoning trade in the species. Not only are pangolins used in Asia as prized and pricey aphrodisiacs, medicines and food; their scales are also adorned as fashion items and trinkets. The trade is not restricted to Asia. Pangolin scales are also available from online sites in the United States, under the guise of ant-eater scale “cures”. Furthermore, the species is literally going up in smoke. A recent Interpol report states that pangolin scales are being routed to the US party drug circuit because their keratin contains Tramadol HCL – a substance binder particle found in psychotropic drugs like methamphetamine. In terms of South African biodiversity legislation, illegal possession of endangered wildlife carries the maximum of a R10-million fine or a 10-year prison sentence. But there is a schism between the laws and their enforcement. But this might be about to change in Limpopo, where the seven arrests took place this year. The most recent arrest was on August 17, when Soweto resident David Chauke was arrested in a Tzaneen sting operation, trying to sell a pangolin to an undercover operative for tens of thousands of rand. 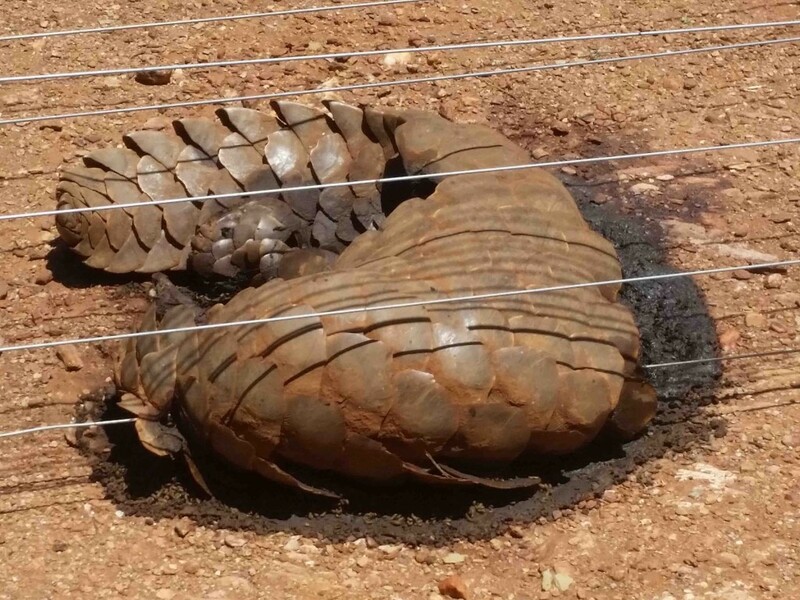 The previous week, three alleged pangolin poachers were detained and charged in Louis Trichardt. At Chauke’s bail application, the magistrate set the amount at R4,000 – higher than the R1,000 each for the three alleged poachers who had been previously arrested. Although R4,000 represents a mere sliver of the tens of thousands the Soweto-based Chauke was allegedly hoping to pocket when he transported the pangolin from Thoyandou in Venda to Tzaneen, stiffer bail penalties indicate that the South African criminal justice system is starting to take pangolin poaching more seriously. At the 17th Conference of the Parties (CoP17) to the Convention on International Trade in Endangered Species (CITES) in late September, this troglodyte species was accorded one of the central stages, alongside rhinos, elephants and lions. In the build-up to the conference conservationists lobbied vociferously for the status of the pangolin to be upgraded from Appendix II – subject to restricted trade – to Appendix I, which means a total ban on trade. On September 28, in a unanimous vote apparently driven by African member states, all CITES range member countries, including China, voted in favour of the uplisting and the resultant ban on trade in pangolins. The conservation world was elated by the unanimous vote. “The uplisting of the pangolin to Appendix I – as with all our endangered wildlife – can be effective, or it will be completely toothless,” cautioned the African Pangolin Working Group’s Rob Bruyns.